Snorkeling and diving Key Largo at the North Dry Rocks (NDR) area is very popular because it combines a variety of options. First, at Double North you benefit from being on a super shallow reef where you'll find some of the best snorkeling Florida Keys has. The colorful fish and coral are plentiful, and some of the coral is absolutely massive in size. This is a more relaxing Key Largo diving area and it's also known as a place for spectacular underwater photography. Part of the reason this reef is a popular underwater photography site is that it's home to an exceptionally large number of angelfish and other stunning tropical fish. If your dive trip takes you just a bit further south to North Dry Rocks, you'll discover one of the most incredible experiences a diver can enjoy. The popular Minnow Cave is alive with thousands of darting silver glass minnows that swim around, completely engulfing you. 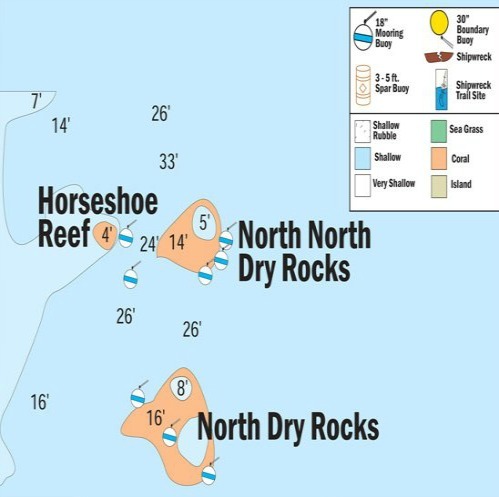 If your diving trip takes you a bit north and west, or from Double Rocks, basically due west, you'll come to Horseshoe Reef. Aptly named, this reef is a long stretch of coral with a "U" shaped hole in it. This reef is also close to shore so it's a good stopping off point on the way back if you've been diving and snorkeling the other reefs in this grouping. Since Horseshoe Reef is close to shore, the penalty is usually the visibility which can be somewhat poorer than further out. However, it's still a good Florida Keys snorkeling site as the coral and tropical fish are impressively abundant at this healthy reef. The North Dry Rocks area is a good place to plan a diving trip, even if it's just to wind down after exploring the nearby wrecks. It's also relatively close to Elbow Reef and Christ of the Abyss so you have the opportunity to enjoy a very full day of Key Largo diving or Florida Keys snorkeling.